A comparison of the difference between being unemployed in various countries and moving to (in this case) the UK and finding a minimum wage job. The report seems to be resting on the assumption that employed people emigrate. Some do, most don't. Of course, that differs at different salary levels. People moving for well-paid positions are often (almost always) already in employment, people moving for minimum wage jobs aren't. From a BBC TV report over the weekend I saw Open Europe referred to as a 'Eurosceptic Think Tank'. I am not sure if this means that the BBC has not researched OE properly or their view is just so Europhile that OE's stance comes across as wildly Eurosceptic to their standard EUSSR-loving viewpoint; could be either or both I suspect. 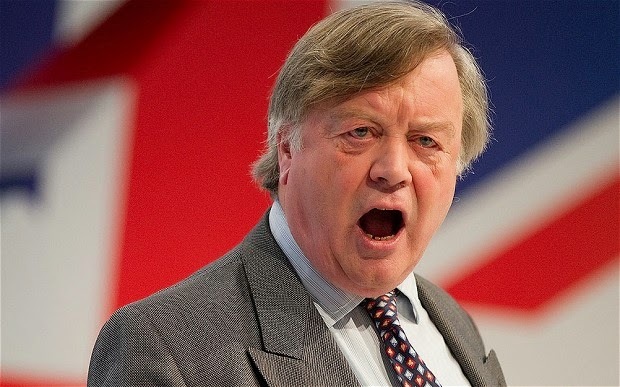 Ken Clarke talks so much EUSSR loving tosh he cannot be taken seriously. The man would still have us joining the Euro for goodness sake. Like John Major (our hero of Exchange Rate Mechanism for the UK and bankrupt the lot of us fame), he refuses to accept the simple facts in front of everyone that the Euro doesn't work and that partly as a result of this the UK will be obliged under EUSSR 'freedom of movement' laws to welcome ever more economic refugees from the Eurozone as the economies of the worst hit of those countries continue to bleed people in need of a better place to live and indeed many of them, work. I expect that OE's masterplan would have some effect upon the numbers entering the UK but I doubt that it would have anything like the type of major impact the majority of UK voters want. As many have pointed out here in the past the immigration problem is not just about workers and benefits it is about the free mobvement of people, working or otherwise. And in any event, I want, nay demand, along with many, many other people, proper democratic control of my country's borders back within the authority of my elected government that will be accountable to me as a UK voter. So, sorry OE but tinkering with the benefits rules will not be anything like good enough. Oh and for the record, I am not some sort of anti EU fanatic, just another one of a legion of ex Conservative voters whom Dave has to woo back to see his party's prospects recover in the polls. Dream on Dave, dream on. Why don't we apply the maxim "What you put in you can get out?" But first you have to put in - or your parents had to put in to make the system of benefits equitable. It matters not whether it's a taxable system or a social system. No indigenous person whomsoever they may be will be sold on the idea that you can have support from a system in which no prior payment or contribution has been made by you or your parents. Unless, of course, your name is Ken Clarke. UK citizens would have to sign up to a reciprocal agreement. Making this global could cause complications unless the benefits were comparable to ours. Open Europe still you put out the message that you are in some way "an honest Broker" for matters EU. You are not. You are an EU organisation with a head office in Berlin. Benefits are the Distraction - and that is all. The NUMBERS are the real Problem. "You can go anywhere - work anywhere for as long as you like. The date of arrival or departure is YOUR choice." The EU, run by Big Business want the benefit of the CHEAP labour. They can turn up or down the heat for Migration by wrecking an economy here and there - something they are very good at. Every country should leave the EU. But the UK has the population will to leave. It is the EU Controlled Parties of Labour, Conservative and the despicable Liberals who want to keep the people in the EU Prison. "free movement is a net benefit to the UK economy"
Nope, don't agree with that, not when everything is taken into account as it should be. Net benefit to the UK economy? Some say that the economy has recovered from the crisis, on a net-basis that might be true, however, the recovery has been for the few and not for the many. Is the net-benefit to the UK economy equally distributed? If a majority sees a loss while the few benefit and the total (the gains of the few minus the loss of the many) is calculated to be a net-benefit, would it make sense for the majority to vote against? Why is there a need for a change of EU legislation? Why can't the UK simply amend the laws to state that all persons (regardless of whether they are UK nationals returning home from abroad! UK nationals living in the UK, or other EU citizens) applying for in-work and out-of-work benefits need to have been physically present and resident in the UK for 3 or 5 years before being able to apply?